If you are not lucky enough to have a caddie to carryyour golf bag, while those electric buggies beloved ofpresidential summits are well out of your price range,then it looks like you're lumbered with carrying yourown clubs. Padraig Harrington Huffing and Puffing? Once you've got over the indignity of all - I mean,you wouldn't find Ryder Cup hero Padraig Harrington huffingand puffing his way from tee to tee - then at leastyou can take comfort in the knowledge that thelightweight materials and space saving designs onoffer today mean taking the strain doesn't have tomean pain, while all those extra pockets incorporatedin to the design leave plenty of room for among things the odd treat tokeep your strength up. On a more serious note, it does pay dividends to finda bag with plenty of storage compartments becauseapart from the essentials i.e. clubs, balls and tees, itis wise to have room for a towel for cleaning clubfaces as well as wet-weather gear and an umbrella incase the heavens open half-way round the course. Equally, a sudden burst of sunshine will requirepeeling off the sweater or cagoule in order to ensureyou feel comfortable with your climactic surroundings. In termsof comfort while carrying the bag, many now comefitted with double, rucksack-style straps that ensurethe weight is spread equally across both shouldersrather than putting the strain on one and risking aninjury that will put a premature end to the day'ssporting activities. In the past some players chose to carry their bag on acart, partly in order that when they stopped to take ashot, the bag was not left on the ground to get dirtyor wet. The manufacturers have negated the need tobuy a cart for this reason by adding metal legs to thesides of the bag that fold out to support it in astand alone position. A cart can also be something of a disadvantage if youare having to drag it up and over the more hillycourses. 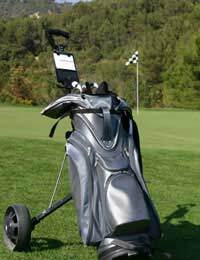 But for around £400, you can invest in adigital model that comes complete with a multi-speedcontroller that ensures your clubs keep pace with you.One point to remember with carts is that they are notallowed to be wheeled across greens. This may notamount to a particularly great inconvenience but it isa point of etiquette that should not be forgottenwhen taking the most direct route to the next tee. Digital carts have also been an important development in ensuring that players not physically capable of wheeling or carrying their clubs around the five or so miles that constitute the length of an average golf course are no longer excluded from enjoying the game they love. For the able bodied among us, good-quality bags retail for as little as £25. So until you find the inspiration to replicate the deeds of heroes such as Harrington and co (I'm still waiting, it should be noted) and acquire your very own caddie, it's a case of picking the best one you can afford, slinging it over your shoulders and heading off down the fairway.